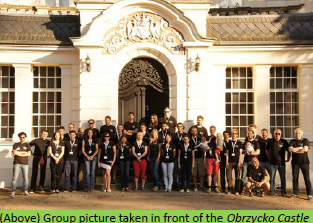 The main aim of the joint OPTIMISE/EUFAR training course was to teach 15-20 early stage researchers (PhD students and post docs) and a limited (max. 5) number of university lecturers how to organize and conduct an airborne campaign supported by a near-ground and small unmanned aerial vehicle (sUAV) field campaign with hyperspectral imaging sensors and spectrometers. These platforms and sensors will be used to determine Earth surface reflectance and fluorescence to support multi-scale (“leaf to ecosystem”) and atmosphere exchange modelling studies. Through this training the students were able to gain a better understanding of complexities and uncertainties in optical Earth observations from near-ground and airborne platforms and by doing so enabled them to better understand the potential and limitations current and future satellite Earth observations and generate greater societal benefits. Besides the lectures on spectroscopy and biogeochemistry, a field campaign took place at the Rzecin wetland site experimental site: students were actively involved in the ground and near ground measurements and validations activities and in the data processing. The program also included some hands-on sessions on spectral data integration into ecological models. Moreover, demonstration on the use of UAVs for ecosystem studies was carried out.